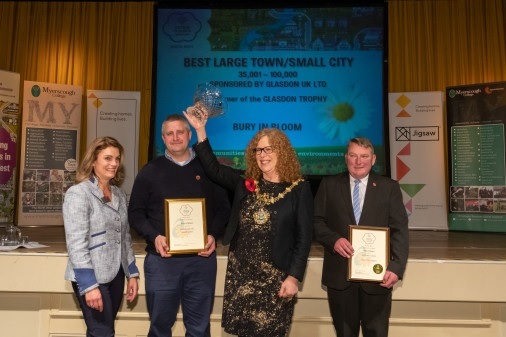 Bury has scooped yet another Gold award and won the Britain in Bloom North West Small City category for the 15th year in a row, thanks once again to an all-round community effort. Bury also received the Environmental Award for local authorities, a discretionary award given by the judges to credit the cleanliness of the town and the general high quality and cleanliness of the parks. And, for the 8th time since 2005, judges nominated Bury to represent the North West region in the 2019 Britain in Bloom national finals. On top of Bury’s success, Radcliffe entered in the Best Large Town category and clinched a Silver-Gilt award for the fourth year running; and Clarence Park, entered in the RHS Park Awards, also came away with a Silver-Gilt. All the awards were announced at a ceremony in Southport on Friday 2 November. In order to win the contest for the 15th year running, Bury had to beat off stiff competition from neighbouring Rochdale and also Chorley. Councillor Alan Quinn, cabinet member for the environment, said: “Huge congratulations go to everyone who has helped deliver these amazing results, despite the challenges of the summer heatwave. Our workforce and all our In Bloom supporters have yet again pulled everything out of the bag and done Bury and Radcliffe proud. “Quality green spaces are hugely beneficial to the local environment but, not only this, they’re vital in supporting the health and wellbeing of our communities too. To support Bury in Bloom or Radcliffe in Bloom, either as a hands-on volunteer or via sponsorship, visit www.bury.gov.uk/buryinbloom-support or phone 0161 253 5266.